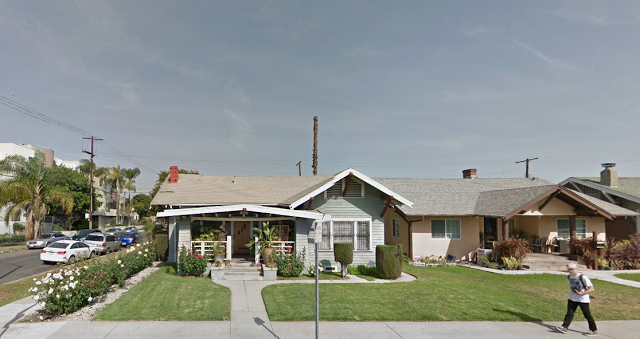 When I moved in three years ago, my block contained mostly single-family homes. 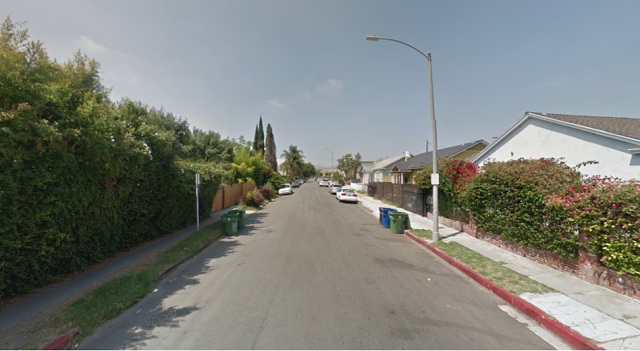 I loved the bedroom-community feeling of my street, tucked inside dense east Hollywood. My neighbors on either side came over and introduced themselves. The woman across the street brought me some homemade brownies. At night, my neighborhood, despite being just one block removed from two major streets, was remarkably quiet. I could sit in my little backyard and hear nothing but crickets and a breeze through the trees. 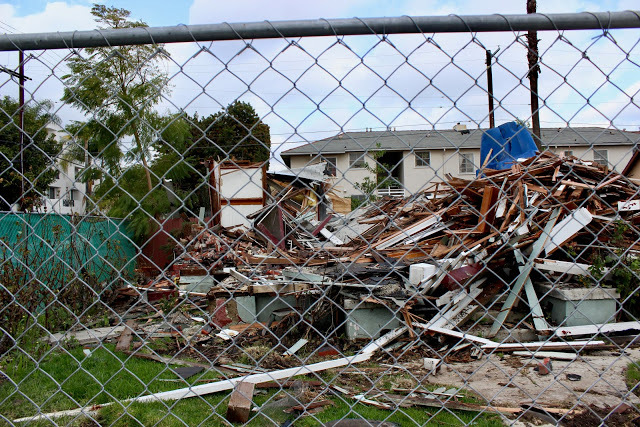 Last year, a developer bought two large craftsman homes on the west side of my block, tore them out and erected double four-plex condo complexes (eight units each) in their place. The atmosphere of my street changed significantly. The sunset used to stretch across the entire west view of the sky, uninterrupted save for the tall cypress in the middle of the block. Now, the complexes cut the sunset off midway across. As I no longer know everyone on my street, I’m less likely to walk outside in my pajamas and chat up my neighbor. Not only are there more cars on my street, due to more residents, but the developments actually removed two street spaces, to make way for wider driveways. New view from the north, condos on the right. 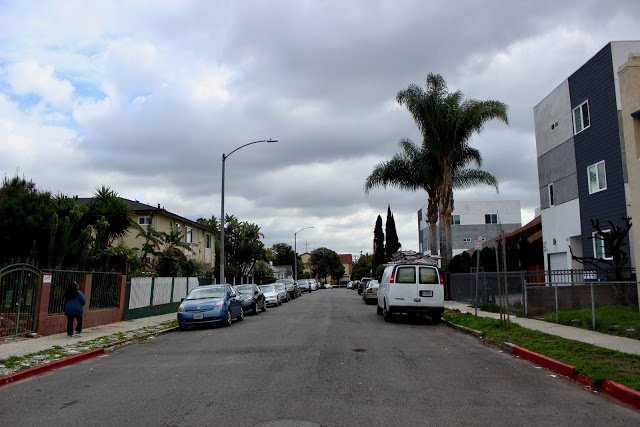 Though my block had become more urbanized in the short time I’ve lived here, one block, directly to the west, remained untouched by development. The street, with its nearly matching craftsmans, was so perfect that movies and TV shows regularly shot there, for the post-war, cookie-cutter character. Each home was well-maintained, their lawns always neatly mowed, flower gardens nicely designed and cared for. The owners seemed to take great pride not just in their own homes, but in the curbside appeal of their whole block. View of the perfect street. On Friday afternoon, as I was driving home, I slammed on my brakes. 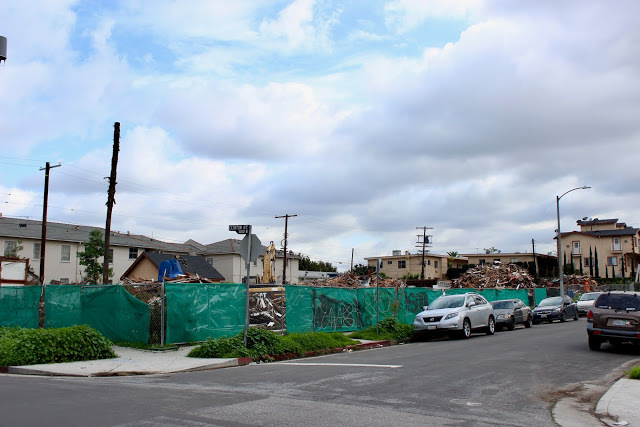 Every single-family home on the east side of that street has been bulldozed. Their large lots now stand primed for one mega condominium complex. The perfect street no more. I hoped the owners of those homes received enormous amounts of money from the developer who must have bought them out. I spoke with a man who lives directly across the street from the new construction zone. He said he heard the impending condominium complex would have nearly a hundred units. He bought his house 20 years ago for $79,000. The homeowners who sold their properties told him they received $700,000 each. Apparently, the sum was enough to make them jump. But I can’t shake the question: at what expense? 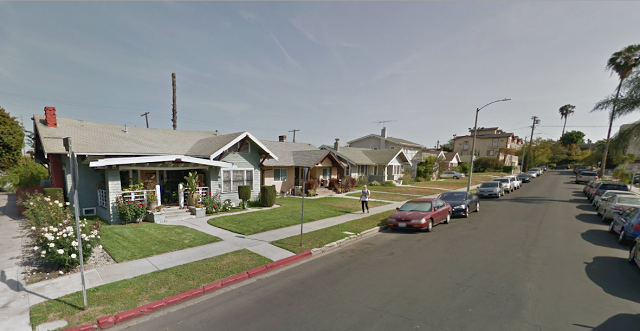 With an ever-growing population, access to housing is an ever-present problem in Los Angeles. A single-family home can only house so many people. As a city person, I’m not opposed to urban development. In fact, I prefer living in dense areas. But I also love LA’s unique juxtaposition of urban and suburban (sometimes even rural, like with the old sheds and stables hidden inside the patchwork of Echo Park). 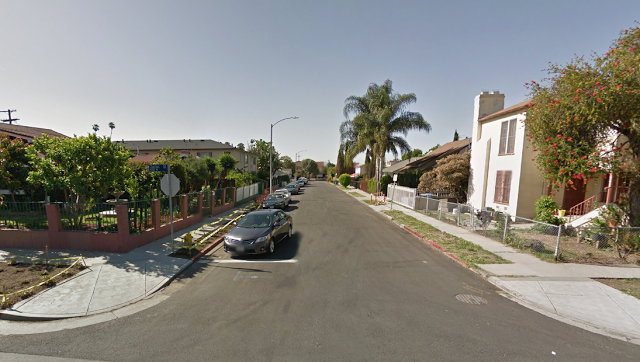 And of course, I loved my little, traditional suburban neighborhood in urban Hollywood. Soon, I fear all of Hollywood will be walled with mega housing complexes, while the traditional neighborhoods will only be found in affluent areas: Hancock Park, the Hollywood Hills.